Camping season is just around the corner! When we think of camping we think of burgers, chips, pop and s’mores. While those are tasty treats, they’re usually packed with sugar, sodium (salt) and calories. There are many healthy and delicious alternatives to a hotdog on a stick! Meals and snacks should help fuel your outdoor activities like hiking, hunting, fishing, and games. With a bit of planning, a cooler, and some aluminum foil, you can create delicious and healthy meals for your next camping adventure! Breakfast is the most important meal of the day! Start up the fire or kettle and go! Measure 1 cup (250 mL) of water into the saucepan. Bring to a rolling boil over the fire. Add 1/2 cup (125 mL) rolled oats (and a handful of raisins and/or a pinch of cinnamon if you like). Top with any or all of the following: milk or milk substitute, fresh or canned fruit, raisins or nuts. Tip: Pre-portion bags of rolled oats with your favorite toppings and put them in a plastic bag or plastic container for easy portioning and transporting. Greek yogurt is high in protein and easy to keep cool in a cooler with ice. Add dried granola and dried fruit for extra energy. A staple breakfast that’s usually not so easy to pack. Before you leave, crack as many eggs as needed into an empty glass jar to avoid eggs cracking in your bag. This will save you on clean up, messy accidents and can stay cold in a cooler bag. Eggs and toast can be easily cooked in a pan over a campfire or using a camping barbeque. Lunch is an important meal to refuel after a morning of outdoor activities. Here are some meal options when the campfire is lit or not! Delicious and easy to make and pack! Grab some whole wheat pitas or whole wheat tortillas, spread on your favorite hummus, and add carrot, celery, and red peppers cut up into sticks. This is an easy prepared lunch that is full of fibre and protein. This bannock recipe can be made while camping without using a single dish! Just prepare the mix ahead of time and you are ready to go. Work dough until smooth and wrap a portion of dough around a clean stick and cook over the fire until brown or about 5 mins. Health Happy Tip: Add peanut butter and raisins to your bannock for protein and fibre. Picnics are an easy and fun activity to do with the family. Grab a blanket, find a cozy spot and enjoy! These picnic staples can be washed, cut and prepared before you hit the trail. Be sure to keep everything in an air tight container and in a cooler bag. The sun is setting and everyone gathers around the fire for stories, fun and food. These simple camping dinners are easy to make and just require some cooking utensils and a roaring fire. Fish is full of healthy fat and high-quality protein. Pick your favourite fish like walleye, salmon or cod; or catch it yourself! Lay your fillet on the tinfoil and rub with olive oil. Sprinkle salt over the fish to taste and layer with sliced lemon. Cover with foil and place on a grill or a pan over the fire. Cooking time depends on the thickness of the fish but should take about 10 minutes to cook fully. It doesn’t get any easier than this! Wrap the ingredients for each side in tinfoil then place on the grill or pan over the fire. Add spices to the sides to cut down on salt and to add flavour! Shake the foil every few minutes to avoid burning your vegetables. Here is a Health Happy take on traditional s’mores! Fun for the family to make and more fun to eat! Extras: nuts, peanut butter, coconut etc. Cut open the banana on one of the seams from about 1 inch from the bottom to 1 inch on the top. Sprinkle in chocolate chips and marshmallows. Close tightly and wrap with aluminum foil. Cook over a fire by tucking it in the logs (not directly on the flame). Let cook for about 4- 5 minutes. Remove with caution, open and serve! Be sure to eat when you feel hungry and these snacks will help you have fun and stay active all day. These snacks can be prepared before the trip and saved in a container in a cooler or bag. 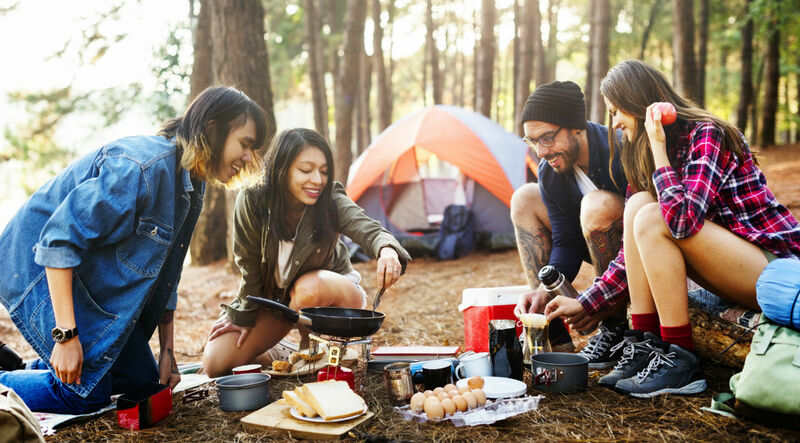 Camping can be an opportunity to eat Health Happy and make choices that will help fuel your activities. Choose meal and snack items based on your preferences that will keep you energized and full. Happy camping!